During the first week of December, the Library and Knowledge Commons will be promoting mental wellness with activities, snacks, and additional study options. Looking for guidance on completing your Div? Need help scheduling or just looking for someone to talk through your ideas with? Meet with us in the Knowledge Commons! 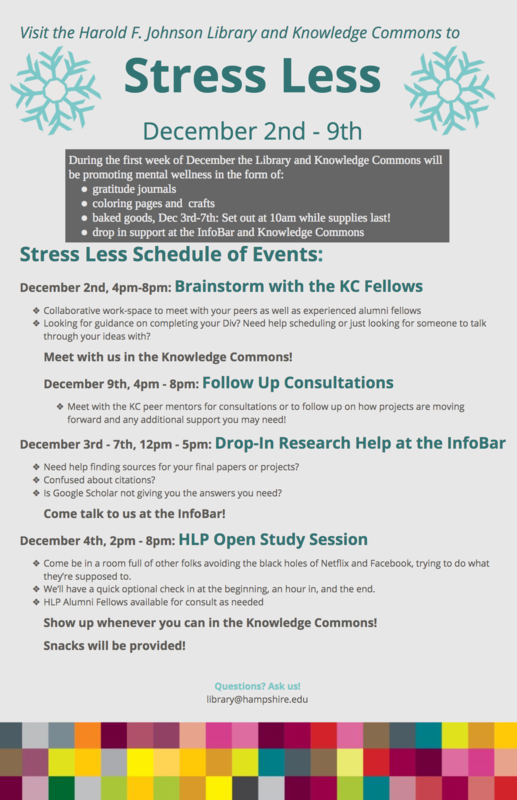 Meet with the KC peer mentors in the Knowledge Commons, for consultations or to follow up on how projects are moving forward, and any additional support you may need! Need help finding sources for your final papers or projects? Google Scholar not giving you the answers you need? Come talk to us at the InfoBar! Come be in a room full of other folks avoiding the black holes of Netflix and Facebook, trying to do what they’re supposed to. Show up whenever you can in the Knowledge Commons! Snacks will be provided!